Measuring what matters in the U.S. This is my first letter as President & CEO of the Guttmacher Institute. Since I joined the Institute in August 2014, I have had the opportunity and the pleasure of learning from the inside about an organization that I had long admired, and relied on, from the outside. Closer exposure has only deepened my respect for Guttmacher’s research, analysis and policy engagement, and its ability to communicate this work to address sexual and reproductive health and rights issues domestically and internationally. The strengths that have characterized Guttmacher’s work for almost 50 years, including a commitment to meeting the highest standards of methodological rigor and making research findings accessible and understandable to policymakers, advocates, the media and those who provide services and fight battles on the ground, will continue to be the bedrock of what we do. Our 2014 annual report is an excellent example of those strengths. It highlights our research and analytical work on the benefits of investing in family planning services in the United States and in the developing world, and demonstrates that addressing the unmet need for contraception—especially among the poorest and most vulnerable—has a huge payoff not only in healthier women, families and communities, but in dollars saved. As we look to 2015 and beyond, and to continuing to do what we do so well, we are grateful to our partners around the country and the globe, and for the generous financial support of the donors who make our work possible. Thanks for standing with us. The Guttmacher Institute regularly estimates the number of unintended pregnancies that are averted in the United States as a result of services provided by publicly funded family planning programs. In 2014, the Institute expanded this analysis to include the broader health benefits these services provide. We found that the services provided in 2010 helped women avoid 2.2 million unintended pregnancies, reduced the number of infants who were preterm or low-birth-weight by 164,000, and prevented almost 100,000 chlamydia infections. Even after the cost of these services is factored in, the publicly funded family planning provided that year yielded net savings to federal and state governments of $13.6 billion, or more than $7.00 for every public dollar spent. To enhance the study’s impact, prior to its release, Institute staff briefed key policymakers, family planning providers and advocacy colleagues on the findings and the strong case they make for publicly funded family planning programs. Those briefings paid off. Some 121 members of Congress cited the findings in a letter to the Obama administration urging increased funding for the Title X national family planning program. In addition, the Office of Population Affairs, the federal agency that administers the Title X program, posted Guttmacher’s infographic on its website. Several media outlets covered the study, as did New York Times columnist Nicholas Kristof, who sent a tweet to his 1.6 million followers highlighting key findings, as well as the Institute’s infographic. Building on that momentum, in early 2015, Institute staff released an interactive web tool that, for the first time, allows family planning providers to generate customized information on the health benefits of the services their specific programs provide and the cost savings resulting from their services. To promote this new resource, Guttmacher staff reached out to providers and key federal program staff to show how this innovative tool can be used to demonstrate the importance of investing in publicly funded family planning services. In December, Guttmacher released Adding It Up: The Costs and Benefits of Investing in Sexual and Reproductive Health 2014, a landmark report documenting the huge unmet need for essential services, including family planning, in the developing world. Today, 225 million women wishing to avoid pregnancy are not using modern contraceptives, and tens of millions lack lifesaving pregnancy and delivery care. Yet, providing critical services—contraceptive, pregnancy, maternal and newborn care including HIV care for pregnant women and their newborns and treatment for four major curable STIs—would cost an annual average of $25 per woman of reproductive age in developing regions. The report makes an especially strong case for family planning, noting that each additional dollar spent on contraceptive services averts $1.47 in spending on maternal and newborn health care. The launch of the report, held in London, was attended by members of the British Parliament, journalists, service providers and advocates. Media coverage was substantial and global in scope, including a commentary in The Lancet and articles in Time, the Guardian and several wire services. As with previous iterations of Adding It Up, the report will remain a valuable and lasting resource for a variety of stakeholders—from global NGOs, multilateral agencies and advocates to U.S. policymakers working to protect funding for international sexual and reproductive health care. We also released two in-depth cost-benefit studies in 2014. In Cameroon, a study by Guttmacher and our local partner, the Institut de Formation et de Recherche Démographiques, found that fulfilling unmet need for contraception would reduce the numbers of unplanned births, unsafe abortions and miscarriages by 75% each, while generating $5.4 million in net savings. In Malawi, we and our partner, the Centre for Social Research, found that meeting women’s need for modern contraceptives would generate an annual net saving of $11 million, and would reduce unplanned births and unsafe abortions by 87% and maternal deaths by 43%. These powerful findings send a clear message to policymakers and the international community: Investing in sexual and reproductive health services throughout the developing world is essential if we are to meet key global health and development goals. 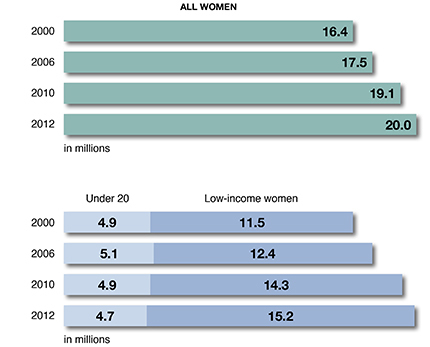 The U.S. abortion rate declined to 16.9 abortions per 1,000 women aged 15–44 in 2011, the lowest rate since 1973. Between 2008 and 2011, the abortion rate fell 13%, resuming the long-term downward trend that had stalled between 2005 and 2008. 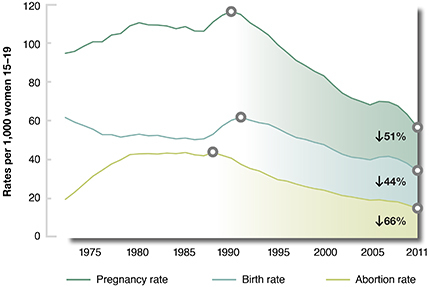 The teen pregnancy rate in 2010, 57.4 pregnancies per 1,000 women aged 15–19, marks a 51% decline from the 1990 peak, and a 15% decline just since 2008. 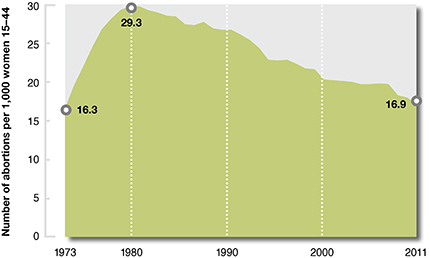 The teen birth rate declined 44% from the peak in 1991 and the teen abortion rate declined 66% between its 1988 peak and 2010. 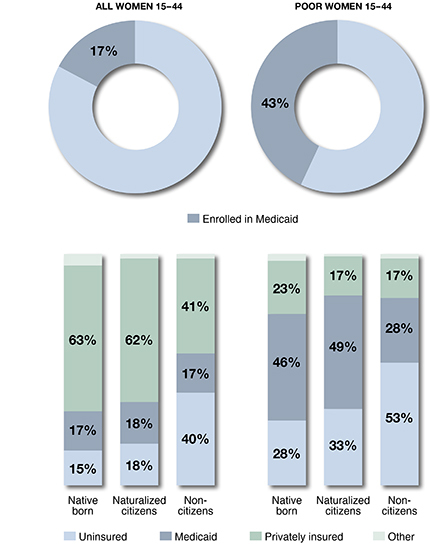 Seventeen percent of U.S. women of reproductive age, and 43% of poor women, were enrolled in Medicaid in 2013. Among women of reproductive age (15–44), 40% of the 6.6 million noncitizen immigrants are uninsured, compared with 18% of naturalized citizens and 15% of U.S.-born women. Between 2000 and 2012, the number of U.S. women in need of publicly funded family planning services increased by 22%, with low-income women accounting for all of the increase. In 2012, 20 million women needed publicly funded services. 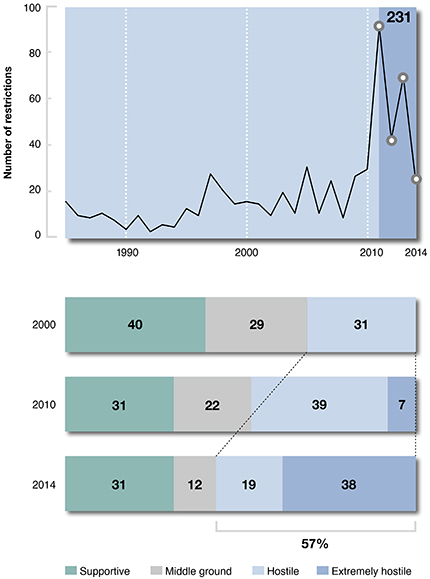 Fifteen states enacted 26 new abortion restrictions during 2014. Including these new restrictions, states have adopted 231 new abortion restrictions since the 2010 midterm elections. In 2014, 57% of women lived in a state that is either hostile or extremely hostile to abortion rights, up from 31% in 2000. 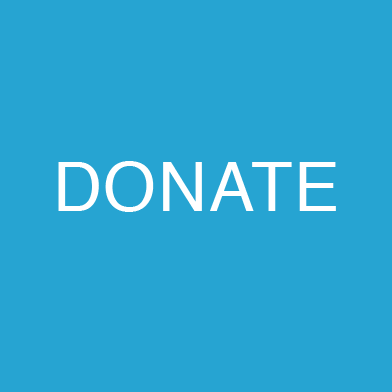 The Gramercy Park Foundation, Inc.
By including the Guttmacher Institute in your will, you can become a member of our Legacy Circle, a special group of supporters dedicated to ensuring that the Institute’s unique model of policy-relevant research and evidence-based advocacy endures for generations to come.